It's hard not to love Bruce Lee. His style, his talent and his powerful aura turned a man of physically small stature into a pure giant of the silver screen. Bruce Lee single-handedly made Martial Arts popular, and his stamp on modern culture has been imprinted deeply in movies and video games ever since. With that being said, it seems so strange that, while his likeness has been imitated often in great video games, titles that officially bear his name have been absolutely awful. 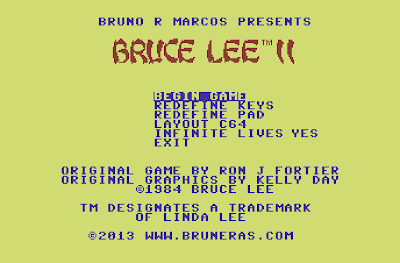 In fact, the only game truly worthy of the license (which was simply entitled "Bruce Lee") was released 30 years ago... Yet now, thanks to Bruno R. Marcos of Cavenaut fame, (finally) a sequel - albeit an unofficial one - has arrived. 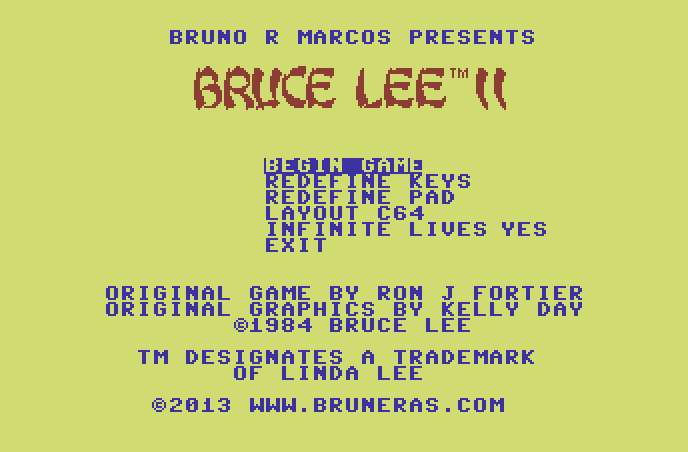 Bruce Lee II is a PC homebrew follow up to the 8-bit classic that was originally released in 1983. Rather than remake the original game with prettier graphics like many, many other homebrew developers have already done, Bruno Marcos has opted to take concepts that worked from the original game (such as collecting lanterns to open new areas) and has built a new story around them, creating an entirely new complex and varied world for players to explore. The story is the usual 1980's still unnecessary fluff - Bruce's sister has been captured by Tao-Bao, an evil wizard, who wants to use her as bait to destroy Bruce Lee. 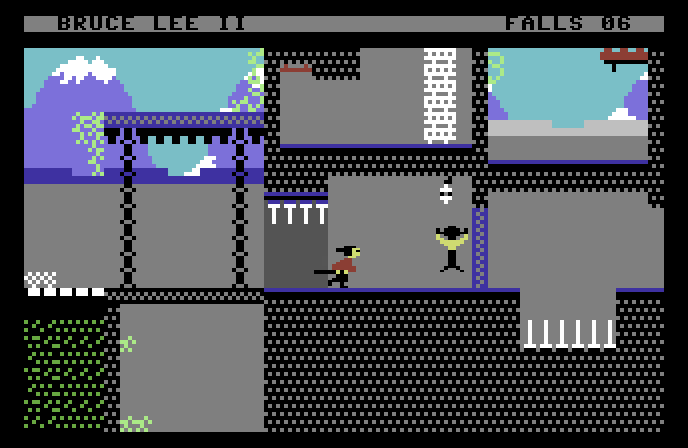 Taking control of Bruce Lee, you must traverse traps, explore secret rooms, and fight dangerous foes in your quest to save your sis. Bruno Marcos obviously holds the original game near and dear to his heart, and has obviously played it across many formats, as he has painstakingly taken the time to create not one, but two graphic modes - one to emulate a Commodore 64, and the other to emulate an Amstrad CPC - and they look absolutely flawless. My only gripe is that the highest selling and highest rated version of the game (ZX Spectrum 48k) doesn't get an homage here. Hopefully one day this game will get an update with a new ZX Spectrum mode! Not only content with emulating old graphics, new enemies have been created in the same style, based upon famous foes from Bruce Lee's movies such as Chuck Norris and Kareem Abdul-Jabbar. These new sprites look fantastically chunky and are instantly recognisable. While the graphics look great, the game runs at a maximum of 40 frames per second. Why it runs at this speed is unknown, as the original C64 and CPC versions of the first game ran at 50. This 10 frame difference from the standard screen refresh rate creates slightly jerky movements which can be quite jarring to players. In addition to this, the slight-yet-unforgiving lag on button presses and directional movements results in you quite often falling off platforms instead of jumping from them. There are other control issues as well. The impact of hits has changed dramatically from Bruce I. Punches and flying kicks used to stop upon impact against an enemy, leaving your character stationary and sending your enemy sprawling away from you. Now there is no sense of impact whatsoever, and a flying kick will not stop propelling you forward, even after impact. This makes fighting extremely easy, as all you have to do is hammer the kick button while moving forward to kill any foe. 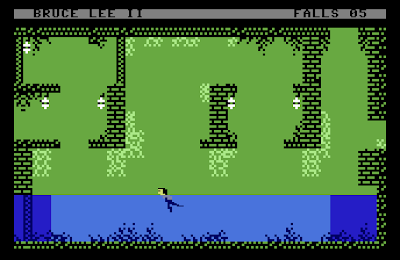 Also, the enemies have a weird tendency to spawn in the strangest of places - mid air, off screen, and occasionally on spikes, killing them instantly. Luckily, the rooms themselves pose more than enough challenge for the average retro gamer, even if the grunts populating the areas are nothing more than flying kick fodder. Unlike Bruce I, there is no scoring system in Bruce Lee II, which means that there is very little incentive to return to this short game after you've beaten it, but it's an extremely fun and challenging ride while it lasts. 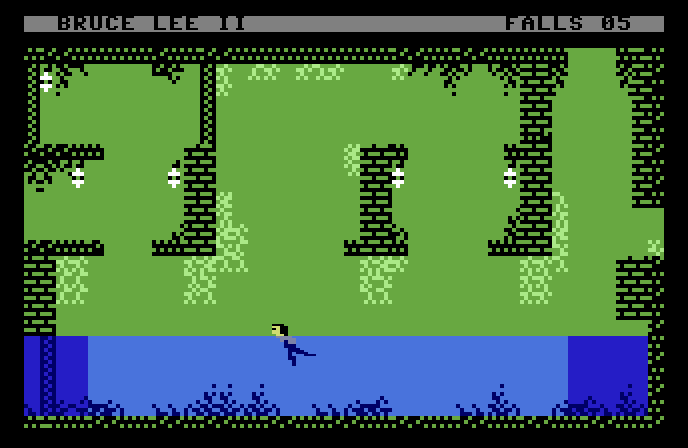 The Jerky movement was present on the CPC version, that was my first target so its like the original (not present on the C64, but I add it). The fighting has been improved on 1.1 version along with other improvements, can be downloaded from the homepage time ago. The c64 screen is displayed with the 50/60 Hz you mention. What you mean by FPS is probably how often the screen-content is changed/updated by the code. By far the most games do that in fact every frame, or at least every 2nd frame so rather 50 or 25 FPS than your estimated 5-10 FPS (this goes for C64). Some games however update a moving screen in 'jumps' of a complete char, which then results in non-smooth appearance but has nothing to do with the frequency of updated sprites/etc. Most games use well timed rasterline interrupts for timing, not just blind screen-update 'when the code is done'. Otherwise you would witness heavy tearing etc. This is also why you have static 50 FPS or a certain constant ratio from that, i.e. 25 FPS as in every-second-frame. I must say this is the most faithful c64 sequal "remade" I ever seen. Only played it for some screens, but want to sit down with a nice vine and enjoy this with a holy feeling inside. Its so well done! I don´t notice anything jerky, as the author of the game pointed out its how it was at the time. I played tons of C64 games and still do ( I have my c64 plugged in beneath my 42 inch tv) So I know for a fact that its not true with 100%. Its the best C64 game made in modern times with autentic c64 feeling to it.